I am so sad to advise you that my wife, Liz died on New Year’s Eve 2017. She died peacefully in the end after having been diagnosed with terminal Pancreatic and Metastatic Liver Cancer on 6th October 2017. Liz’s funeral will take place at Cardross Crematorium, Cardross, Dumbarton G82 5HD. Bob Scott, Funeral Celebrant for the Humanist Society of Scotland will be the Master of Ceremonies at her funeral. The funeral will start at 10 am on Saturday 20th January 2018. We have exclusive use of the venue that morning from 9.30 am so there will be plenty of parking spaces available. There will be four speakers and some of Liz’s favourite music to listen to. This will be a ‘Humanist Celebration’ of the ‘Life of Liz Evans’. No black, but colourful dress please. There will be a buffet from 11.30 am at the ‘Wake’ after the funeral at Fruin Farm Restaurant Loch Lomond, Glen Fruin, by Helensburgh, G84 9EE (a 20 minute drive via Helensburgh). We have exclusive use of the venue so there will be plenty of parking. As so many family and friends have been asking to be kept in touch by e-mail and wishing to go to the funeral of Liz, it would be incredibly helpful to know if you would wish to go to the Wake afterwards so we provide enough refreshments at the buffet for everyone. So please let us know if you can come? There will be an opportunity at the Wake to give short talks on how Liz affected your lives, if you so wish. Already some friends have asked if they may speak and we are delighted they wish to. Liz was 65 when she died on New Year’s Eve 2017. She had a very full life, achieved a lot and did a lot. She touched the hearts of many people and was an inspiration to many in the outdoor world. 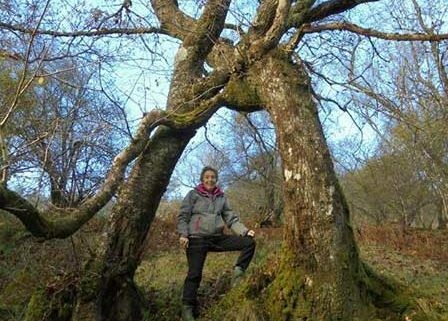 Her passion over the last 20 years until her end was Cormonachan Woodlands by Carrick Castle and as Chair of the Cormonachan Woodlands Association she provided the drive to maintain these lovely ancient Atlantic oak and hazel woodlands for education, community recreation and conservation. 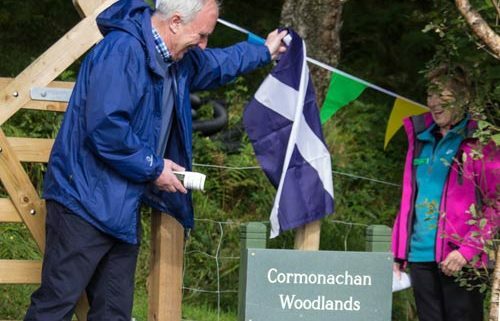 Liz’s final request was that there would be just one bouquet of flowers from her close family and that instead of flowers from others, she would like donations to be made towards a ‘Contemplation Shelter’ in the woodlands to the Cormonachan Woodlands Association that would be created in her memory. When the Association has raised enough money to build the shelter, an oak tree will be planted by it and her ashes will be scattered there by her son Calum and myself. The photo of Liz was by the Loving Trees alongside the Squirrel Trail in Cormonachan Woodlands. This was her last visit to the woodlands on 12th November 2017. We are pleased to announce the official opening of the new car park on Thursday 14th September 2017. 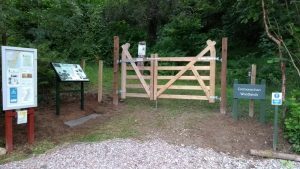 The car park was opened by James Fraser of Friends of Loch Lomond and Trossachs and a director of Ardroy Outdoor Education Centre. The opening lasted about an hour with a guided walk around the Squirrel Trail where Liz Evans, our Chair and also a director of Ardroy, showed those attending the work of the Association in managing the community woodlands, the interactive and other sculptures en route around the paths and explained our plans for the future. Thank you for all the donations that have been received – we are very grateful for your great support towards the Car Park. The last Committee Meeting was on 6th March 2018. The next Committee Meeting date will be on 3rd April 2018. The next Annual General Meeting of the Association will be on 1st May 2018 at the Lochgoilhead Village Hall at 7 pm. 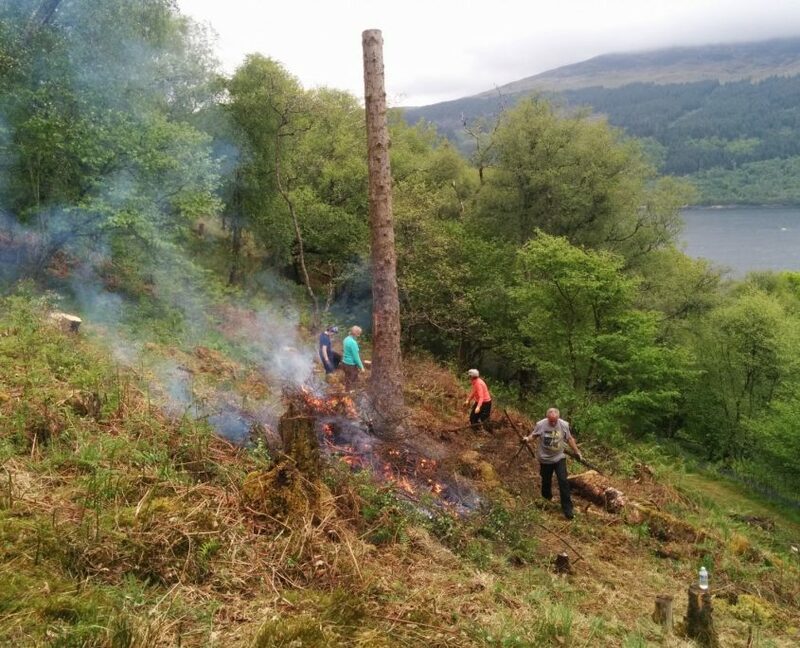 Eight Cormonachan Woodlands Association Volunteer Members worked for three hours on Sunday afternoon at the Volunteers Day. All the brash and old felled trees were cut up, cleared and burnt ready for the new sculpture to be erected on this totem pole (see photo below). The paths were strimmed from the car park to the third Squirrel Trail’s sign (clockwise direction) and the ditch at the south west corner of the Squirrel Trail was completely cleaned out (this is the point where the next project will start of a path to Upper Cormonachan & the waterfalls). The branches and logs were chainsaw-ed, clearing and tidying up the same area. A very big thank you to our volunteers for the hard work in achieving so much in just a short time. Despite the forecast for rain, there was none, it was dry and no midges! Another sunny and dry day for our Cormonachan Woodlands Volunteers Day on Saturday 22nd April 2017 from 10.00 to 16.00 hrs. We had four volunteers in the morning removing a tree that had fallen on the top path, strimming some path areas and erecting a new oak bench at the north west corner of the top path. This will be a welcome resting place with a lovely view. Two volunteers left at lunchtime and two others arrived in the afternoon to make four again. They erected another oak bench in the car park and the low path was strimmed between Jan’s Hideaway and the car park. 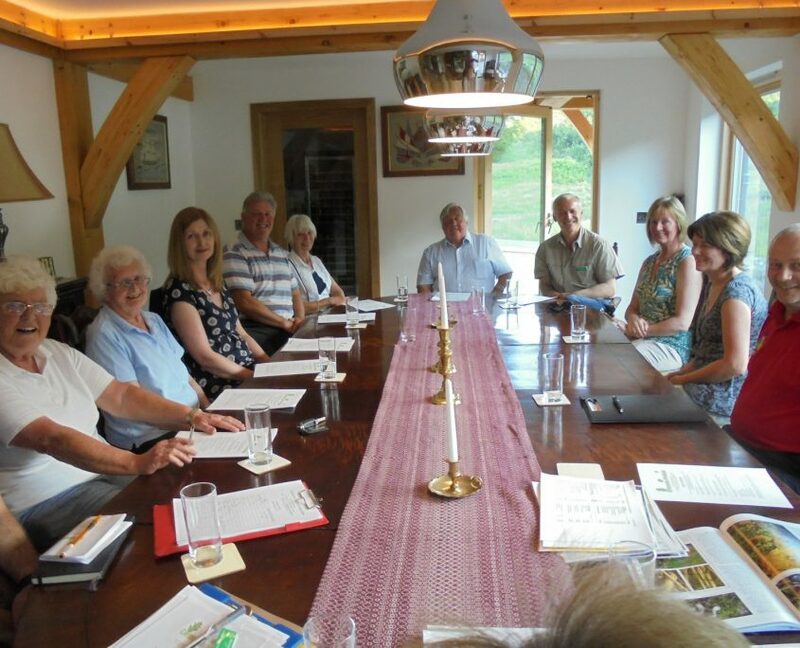 A big thank you to our volunteers – your help was amazing in achieving so much in such a short time. What a fantastic Volunteers Day! 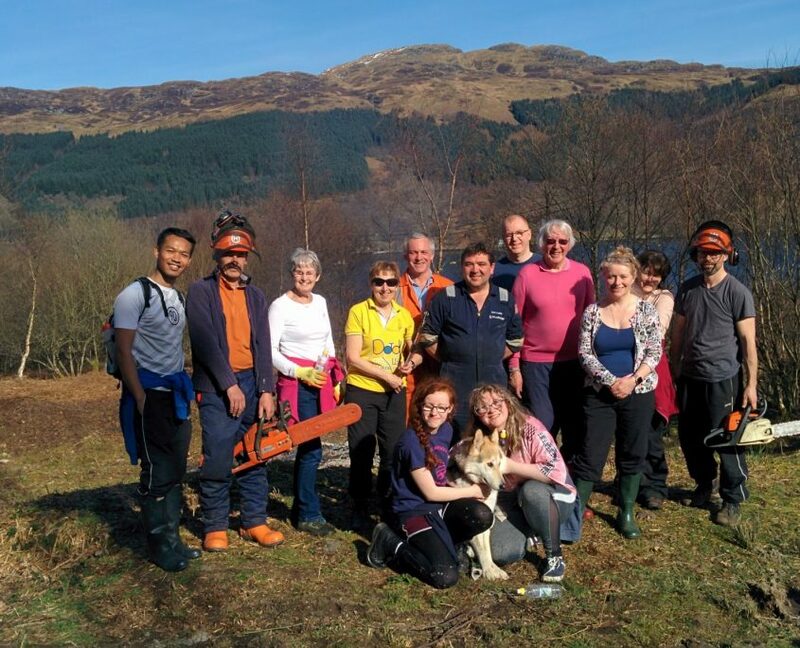 We had 16 volunteers working in four groups and achieved an enormous amount of work in Cormonachan Woodlands between 13.00 & 16.00 hrs. A huge THANK YOU to everyone. Team 1: 3 volunteers cleared and burned all the brash in the car park extension area so that work can soon commence there. Team 2: 6 volunteers cleared all the overhanging branches and all the tree seedlings and bigger shrubs off all the paths. Team 3: 3 chainsaw volunteers tidied up the felled trees from the chainsaw training days. Team 4: 4 volunteers repaired a big culvert, levelled up a picnic table and carried two new benches to a) the far north west corner of the woodlands and b) to the car park area ready to be erected in the near future. Perfect weather, warm and sunny and hopefully everyone enjoyed themselves as well as really improving the woodlands.